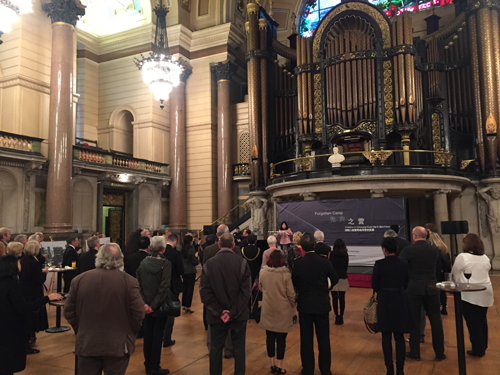 On 6 November, 2015, "Forgotten Camp - Exhibition on Shenyang World War II Allied Prisoners Camp", jointly sponsored by the Chinese Embassy in the UK, China Daily, Shenyang World War II Allied Prisoners Camp Site Museum and Liverpool Culture Bureau, opened at St George's Hall in Liverpool. Minister Shen Beili of the Chinese Embassy in the UK addressed the opening ceremony, which was attended by than 100 Chinese and British guests from all walks of life including Lord Mayor of Liverpool Councillor Tony Concepcion, Assistant Mayor of Liverpool Wendy Simon, Curator of Shenyang World War II Allied Prisoners Camp Site Museum Fan Lihong, and Editor-in-Chief of China Daily European Weekly Ji Tao. "This year marks the 70th anniversary of victory of the War of Chinese People's Resistance Against Japanese Aggression and the World Anti-Fascist War", Minister Shen said, recalling the Chinese people's 14-year bloodshed and battles, and their final victory over the Japanese aggression 70 years ago. She also recalled the enormous international support for Chinese People's resistance against Japanese aggression, including the support from the UK, and emphasized that the Chinese and British people had made everlasting historic contributions to the victory over fascism. Minister Shen noted the profound changes in the post-war international system and order that China and Britain helped to establish and the extraordinary course of China-UK relations since then. This relationship was given a strong boost not long ago when Chinese President Xi Jinping paid a state visit to the UK and the leaders of the two countries agreed to build a global comprehensive strategic partnership for the 21st century and to open up a "golden era" of enduring, open and win-win China-UK relations. "The people of China and the UK formed profound friendship during fighting against the fascist enemy. Today, we have every reason to join hands to contribute to the 'golden era' of relations between the two countries, and to the peace, stability and prosperity of the world." Assistant Mayor Wendy Simon said that the rare pictures and literature reconstructed a history not known to Westerners, and he hoped that the exhibition would allow more Britons to understand the hard and miserable war in the Pacific. Curator Fan Lihong expressed her hope that, from the exhibition, British viewers would know the hunger, diseases and difficulties of Allied prisoners, and would appreciate their perseverance, optimism and wisdom in the face of difficulties. She also hoped that the exhibition would offer a unique perspective to visitors to have an in-depth and comprehensive understanding of World War II in Asia and the Pacific. Alan Joy, son of a British soldier Ronald Joy who was once a prisoner at Shenyang World War II Allied Prisoners Camp, talked about how his father had suffered in the prisoners' camp, and donated to Shenyang World War II Allied Prisoners Camp Site Museum some items that had been used by his father in the prisoners' camp. Shenyang World War II Allied Prisoners Camp was one of over 200 Japanese camps built to house Allied prisoners in Asia and the Pacific during World War II. From November 1942 to August 1945, it housed over 2,000 POWs from the UK, the US, Canada, Australia and other countries. 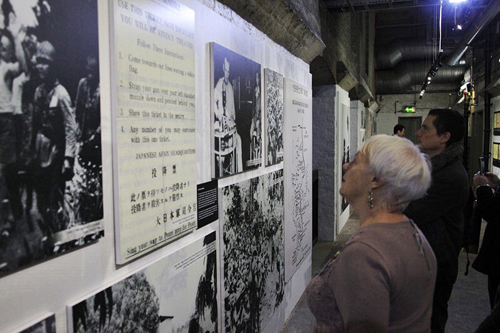 The exhibition of the rare photos and files of Allied prisoners brought to light the ordeal of the prisoners of war at Shenyang World War II Allied Prisoners Camp. The exhibition would run from November 7 to 15.